Bens Hut in Castleside, near Consett sleeps 3 people. 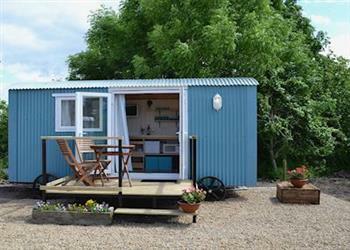 Bens Hut near Consett is peacefully set amidst rolling countryside on a 200-acre sheep farm; Ben’s Hut is the perfect property for couples and families who enjoy an adventure. Simple yet perfectly formed, Ben’s Hut offers cosy accommodation with a double bed and a shower room incorporated into the hut, so there’s no need to traipse across a field every time you want to go to the bathroom! There is a small kitchen area with a fridge, microwave, kettle, toaster and a fold-away dining table with chairs. Every tiny detail has been thought of by the owner, even down to the wool-based insulation, which keeps the hut warm and welcoming at any time of year. Ben’s Hut sits naturally amongst the grounds of this working sheep farm, and it has a private parking space and decking area with table and chairs. The tranquil location makes this the perfect place to relax and unwind, and there are many footpaths and cycle routes nearby with excellent views over the landscape. Situated on the Durham/Northumberland border, the property is ideally located for exploring the many attractions both counties have to offer. The historic city of Durham, with its boat trips and magnificent cathedral, and the market town of Barnard Castle, with its 12th-century castle, are both just a short drive away. The award-winning Beamish Open Air Museum is just 13 miles away, and is well worth a visit. Newcastle and Gateshead offer an array of museums and art galleries, along with excellent shopping, all just 18 miles away. The lovely scenery of the Northumberland National Park is within a half hour’s drive, as is Hadrian’s Wall. A little further afield, there’s Alnwick Castle and Gardens, along with some glorious, unspoilt stretches of coastline about an hour’s drive away. The shop, pub and restaurant are 1 mile from Bens Hut near Consett. Step to entrance. Bens Hut is all on the ground floor. Living area: With 18 Freeview TV and DVD player. Kitchen area: Galley-style with microwave and fridge (no cooker). Gas central heating, electricity, bed linen and towels included. Welcome pack. Enclosed decking area with garden furniture. Private parking for 1 car. No smoking. Please note: The property has a natural water supply from a spring. Holidays at Bens Hut run from Friday to Friday. For a better idea of where Bens Hut is, you can see Bens Hut on the map below. Bens Hut is in Durham; should you be on the lookout for a special offer, you can find all the special offers in Durham. It's always worth checking to see what is on offer at the moment. Do you want to holiday near Bens Hut (UKC569), you can see other cottages within 25 miles of Bens Hut; have a look to find your perfect holiday location.